„The Prize is for all Venezuelans in the world,” said Parliament President Antonio Tajani while awarding the prize. The President noted that the human rights situation in Venezuela was deteriorating and called for a “return to free elections with the participation of all so that the Venezuelan people can decide their future”. “Last weekend, President Maduro decided in an arbitrary and anti-democratic way to prohibit the main opposition parties from running for the presidential elections. This situation cannot continue like this,“ Tajani said. „We want the country to return to democracy, to dignity, and freedom,” he stressed. Accepting the award, Julio Borges, chair of Venezuela’s national assembly, said: „[The Sakharov Prize] is an acknowledgment for mothers denying themselves food to save their children, for children rummaging in the rubbish to satiate their hunger, for old people wasting away to death because of a lack of medicines. A young person who has now emigrated out of despair to seek opportunities elsewhere is another recipient of this prize as is a teacher overcoming ideological blindness and sticking to the task of training free men and women for Venezuela. Or again, those who are fighting for human rights in Venezuela, Venezuelan journalists who take risks throughout their lives in trying to show the true facts that people are trying to keep silent.“, said Mr Julio Borges, President of the Venezuela´s National Assembly. Later on Borges called for humanitarian help, saying: „Hunger has been made into a political system in Venezuela: 75% of Venezuelans have lost 10 kilos weight over the last 12 months.” He also urged the EU and the world to follow the presidential elections attentively. 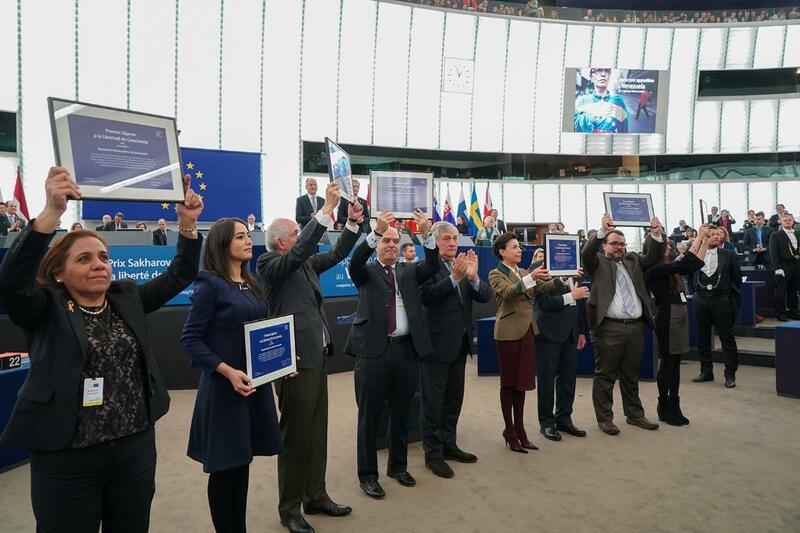 On 26 October, Parliament President Antonio Tajani announced that the 2017 Sakharov Prize for Freedom of Thought would be awarded to Venezuela’s democratic opposition. This followed a decision by the President and Parliament’s political group leaders. The democratic opposition includes the country’s national assembly (represented by Julio Borges) and all political prisoners as listed by Foro Penal Venezolano (represented by Leopoldo López, Antonio Ledezma, Daniel Ceballos, Yon Goicoechea, Lorent Saleh, Alfredo Ramos and Andrea González). To mark the 30th anniversary of the prize, the Parliament, together with Magnum Photos, followed the daily life of four human rights activists from Tunisia, Cambodia, Ethiopia and Bosnia and Herzegovina. The photo exhibition They Defend our Freedoms – 30 years of the Sakharov Prize was inaugurated in the Parliament on Tuesday 12 December and will be shown throughout the EU in 2018.